Great when traveling as its Protective carry bag keeps all baby’s essentials clean and together. 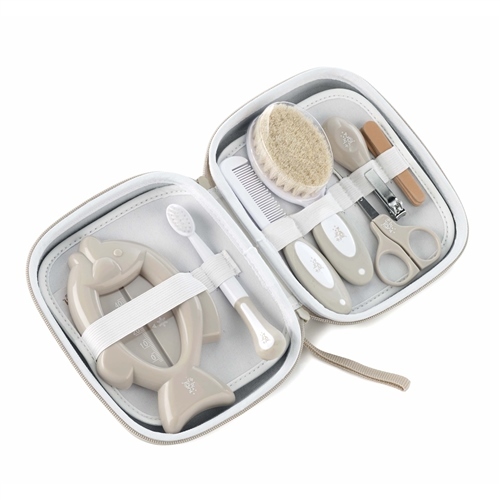 Soft brush for baby’s delicate skin. Grip safety scissors, with rounded tips. 4 nail files (baby emery boards). Protective handy toilet bag with zip. The items were very neat and handy and in a well presentable case. Although my baby is too little the moment, I am looking forward to being his personal barber when he grows a bit. Excellent set. Brought for a friend's daughter, who had not thought of these items she will need! Nice little carry case too. Recipient really happy with this set.